We are a leading Wholesale Trader of abamune-l from New Delhi, India. Abamune-L is taken with other antiretroviral medications to treat adults infected with HIV-1. A single pill is the equivalent of 300mg of lamivudine IP and 600mg of abacavir. At least one other anti-HIV medication must be co-administered with Abamune-L to effectively prevent HIV from progressing to AIDS. 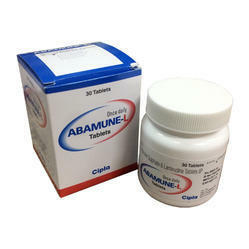 The recommended dose of Abamune-L for adults is one pill daily along with other antiretroviral medications. Abamune-L may be taken with or without food. Any patient who has hepatic impairment should not take Abamune-L. Anyone with a prior history of hypersensitive reaction to abacavir or any of the other ingredients in Abamune-L should also not take the drug. Do not take any abacavir containing products after experiencing a hypersensitive reaction. In rare incidences, cases of fatal hypersensitive reactions to abacavir, a core ingredient of Abamune-L, have been reported. Other side effects may occur. Let a doctor know immediately if you feel any changes in your well being when you begin taking Abamune-L.